Last year we saw the launch of the Epic Games Store on PC, arriving to do battle with the likes of Steam, GOG, UPlay, and EA Origin. The new online games store comes from the makers of Unreal Engine, and the more recent headline-worthy game Fortnite, Epic Games. The firm's plan is that its "worldwide digital commerce ecosystem supporting dozens of payment methods," will come to the fore thanks to a growing list of exclusives and a much more generous revenue share model than competitors offer. Epic has been planning the Epic Games Store for a number of years, but accelerated development due to the success of Fortnite. Perhaps due to this accelerated roll-out, the store launched with just a handful of games - just three titles. Of course, with such a proposition a store search function is just UI clutter. A few hours ago Epic announced a Search Function for its store. 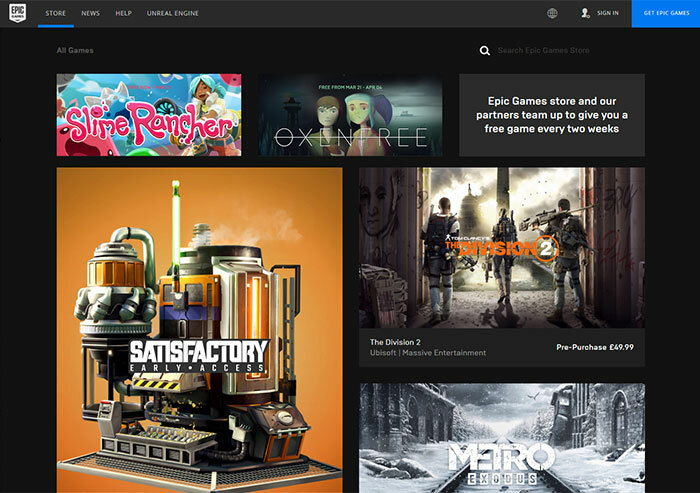 Checking out the Epic Games Store pages you will now find a search box at the upper right. It is pretty useful now, as I see there are about 30 games or more available and eight 'coming soon'. Don't forget to check every couple of weeks to see what the Epic Games Store freebie is - currently it is Slime Rancher. In recent weeks a couple of big AAA games have decided to go Epic rather than Steam; notably The Division 2, and Metro Exodus. Illustrating the attraction of the Epic Games Store, Matthew Karch, CEO of Saber Interactive (developer of World War Z), recently explained "We chose the Epic Games Store because we believe it’s the best deal for players and developers… Building games is costly, and so to receive 88 per cent instead of 70 per cent means we can invest more into making World War Z". Saber went on to cut the list price of World War Z from $40 to $35 to share the benefits. In an interview with MCV published earlier today Epic's Tim Sweeney talked up the potential of the new PC games store. Sweeney asserted that "The last remnants of the old retail model of gaming are falling apart". Epic is seeking to change the model in its favour by not only offering a better revenue share to developers but offering additional financial incentives to come onboard. All this is possible thanks to the great success of Fortnite over the last year. A PC games store with marginal benefits won't get traction in the current environment, so that's why the revenue share is very much better from Epic - to gain developers and exclusivity. The central thrust of the Epic Games Store is to win on "game supply, consumer prices, and developer revenue sharing," said the Epic CEO and Founder. Moving from today's "50-game version of the Epic Games Store" to the "250-game version" users and developers will see that it is "significantly evolved," through 2019. One aspect that would definitely be different could come from a signalled change to an emphasis on creator channels. "Viewership of creator channels has greatly outgrown any storefront. In Korea and China, the primary game distribution vectors are social: WeChat, KakaoTalk and QQ, rather than storefronts. As with the twists in Fortnite's evolution, one shouldn’t necessarily project the Steam or App Store paradigm onto its final form," Sweeney told MCV. Has there been any word on Linux support from Epic? As long as Fortnite remains popular the Epic store will have generous funding so it's not going away any time soon, kids will eventually grow out of Fortnite but that could take many years. Tim Sweeny considers this his moment to take on pretty much everyone.